National RF's Type HFDF active directional antenna system consists of a high gain RF amplifier coupled to a tunable Faraday shielded loop antenna. 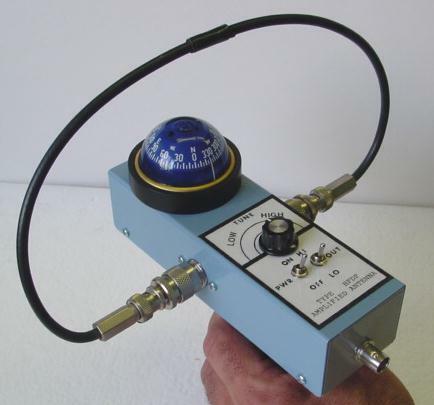 Several loop antenna assemblies are available to provide coverage of frequencies in the HF and low VHF spectrum. Due to the nature of a Faraday shielded loop, the antenna exhibits a sharp null through the diametric center of the loop. This null is used to determine the direction of incoming radio signals or to locate electrical noise being radiated from some source. The internal high gain amplifier is used to compensate for the inherent inefficiency of the actual loop at the operating frequency. Overall, the system dynamic response is about +6 dB as compared to the dynamic response of a dipole. To aid in the direction finding process on strong signals, an internal 30 DB attenuator is provided. As the loop antenna presents a bi-directional response, tri-angulation may be required to eliminate the ambiguous signal direction. The line of site of the incoming signal is determined by listening for a signal null on the receiver or by watching the receiver’s S-meter. The loop elements are mounted on a metallic enclosure with an oil-filled compass attached and a pistol grip for ease of operation. A single 9-volt battery is required for operation.. The battery and the HF receiver are the responsibility of the customer to provide. Type HFDF is exceptionally useful in the location of power line noise and other noise sources in the HF radio frequency spectrum and has been purchased by numerous utility companies for this sole purpose. **New** Loop AA - 3.5 to 8.0 MHz loop now available. Tuned to cover the low end of the HF band, this loop offers coverage of both the 80 and 40 meter amateur radio bands. It is also ideal for low frequency noise location, especially noise radiated by dirty power line insulators. The loop incorporates a small loading coil, thus making it manageable and compatible in size with the rest of the loops. Overseas Customers: An additional shipping charge will be applied to orders from outside of the United States and determined after order placement. Orders from Alaska, Hawaii, and Puerto Rico may incur an additional charge, depending on the shipment service. We will notify you via email of the amount additional, if any. The customer is responsible for all and any customs or tariff charges applied to your order.